Last February, Wagner James Au wrote a remarkable post on his blog, New World Notes, entitled Woman with Parkinson's Reports Significant Physical Recovery After Using Second Life - Academics Researching. He described the way in which an 85 (now 86) year old patient with Parkinson's, whose avatar is named Fran Seranade, seemed to be reversing the effects of the disease through mental imaging associated with her avatar. "SL has truly helped her experience life as young as she feels inside," says her daughter, whose avatar is Barbie Alchemi. "SL has made a huge difference in my mom's abilities and has slowed down and in a few ways reversed some of her symptoms." Barbie and Fran are in the image below (left and right respectively), flanking Fran's son AlmostThere Inventor, and they're a delightful trio—I had the pleasure of first meeting them when I did a photo shoot for Isadora Fiddlestick's article about them in the July issue of AVENUE magazine. Their home in Second Life is Creations Park, a space dedicated to raising awareness about Parkinson's and research. And next week they're participating in a special event, conceived and organized by Solas (a.k.a. SolasNageaLai Resident), to help raise funds for the Michael J. 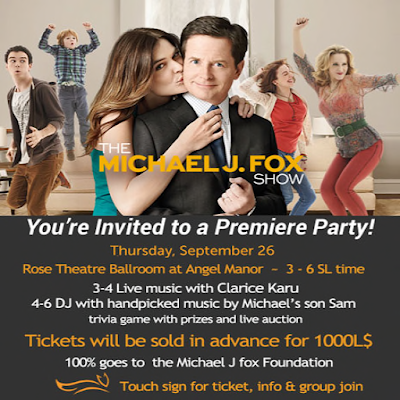 Fox Foundation: on Thursday, September 26, when the Michael J. Fox Show premieres on network television, you can celebrate inworld at a VIP Premiere Party at the Rose Theater Ballroom. Only 100 tickets will be made available (and a few have been taken already) at L$1,000 each, with all proceeds going to the foundation. To purchase a ticket, you simply join the VIP Premiere Party group, which costs L$1,000, and you're all set. You can find a group joiner at the Creations Park landing point (link above). The premiere will featured live music with Clarice Karu, and then two hours of music handpicked by Michael's son, Sam. A live auction, details forthcoming (I'll post info), will also take place. You can learn more about Fran and her family's project at their blog, Creations for Parkinson's.